By integrating Synthetic Classic with the Dynatrace platform, you gain the ability to push monitoring data from your synthetic tests to Dynatrace where it can be tracked and analyzed on dedicated synthetic test dashboard tiles. It&apos;s then easy to drill down from selected tests on your Dynatrace dashboards directly to the Synthetic Classic Portal. Once you&apos;ve configured the integration between Synthetic Classic and Dynatrace, two tiles for synthetic tests are automatically added to your Dynatrace home dashboard. Going forward, whenever you view a synthetic test in Dynatrace, you can drill down from the test&apos;s page to the Synthetic Classic Portal&apos;s Test overview page. All drilldowns from the Test overview page and other portal features are then available for data analysis. To set up integration between Synthetic Classic and Dynatrace, you need to configure settings in both Dynatrace and Synthetic Classic. You must also configure alerts in the Synthetic Classic Portal to view problems in Dynatrace. See Receive alerts and notifications for Classic tests below. Generate a Dynatrace access token to enable integration with Synthetic Classic. From the Dynatrace navigation menu, go to Settings > Integration > Dynatrace modules. Click Generate token for Dynatrace Synthetic. The new token is enabled by default. Copy the URL string of the environment ID in the provided Synthetic Classic configuration to your clipboard. Dynatrace SaaS deployments – Copy your environment ID including the initial https:// but not the trailing slash. For example, if the URL is https://abcdef.live.dynatrace.com/#dashboard you would copy https://abcdef.live.dynatrace.com. Dynatrace Managed deployments – Copy the Cluster ActiveGate endpoint plus the environment ID. Copy the Cluster ActiveGate endpoint from the Cluster Management Console at Settings > Public endpoints > ActiveGate URL. Copy the environment ID string /e/&lt;EnvironmentID> from the Dynatrace Managed URL, not including the trailing slash. For example, if the URL is https://abc.dynatrace-managed.com/e/ee0000e-1234/#dashboard you would copy /e/ee0000e-1234. In the Synthetic Classic Portal, configure the account settings. 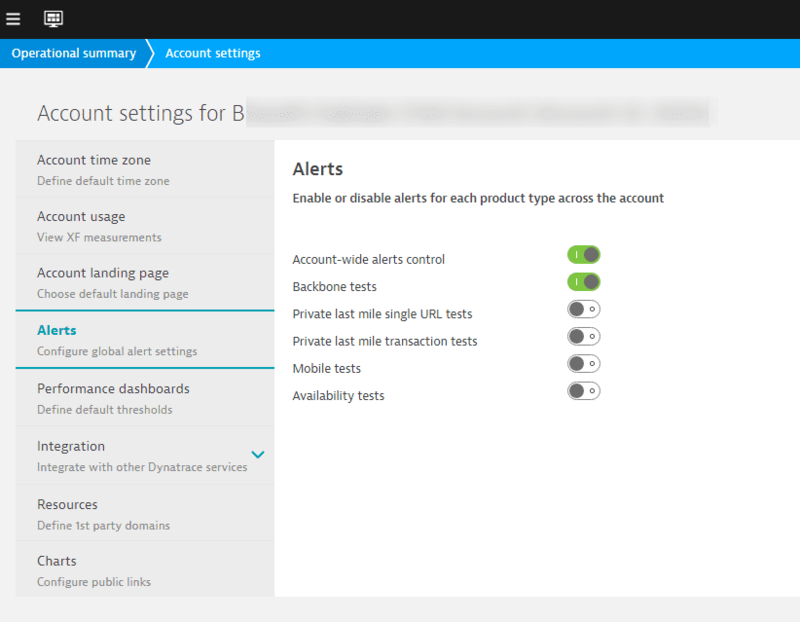 Go to > Account settings, then select Integration > Dynatrace SaaS/Managed. In the Tenant key field, paste the environment ID from step 2 of the previous procedure. Dynatrace SaaS – Paste the copied URL string. Make sure you include the port in the endpoint URL. For example, if the endpoint, with the port, is https://SecurityGatewayDomain:9999 and the environment ID string is /e/ee0000e-1234, enter https://SecurityGatewayDomain:9999/e/ee0000e-1234. In the Dynatrace token field, paste the Dynatrace access token string you generated in step 1 of the previous procedure. To get the token, return to Settings > Integration > Dynatrace modules in Dynatrace and expand the token you just created. The new token is now listed on the page. Make sure the token is enabled . Once you&apos;ve set up your integration, you can focus in on your Synthetic Classic tests in Dynatrace—select the Synthetic tab and filter for the Classic type of synthetic monitor. To receive notifications about problems detected by Dynatrace, you must configure alerts in the Synthetic Classic test settings. Ensure that account-level alerts are turned on. Navigate to Account settings > Alerts. 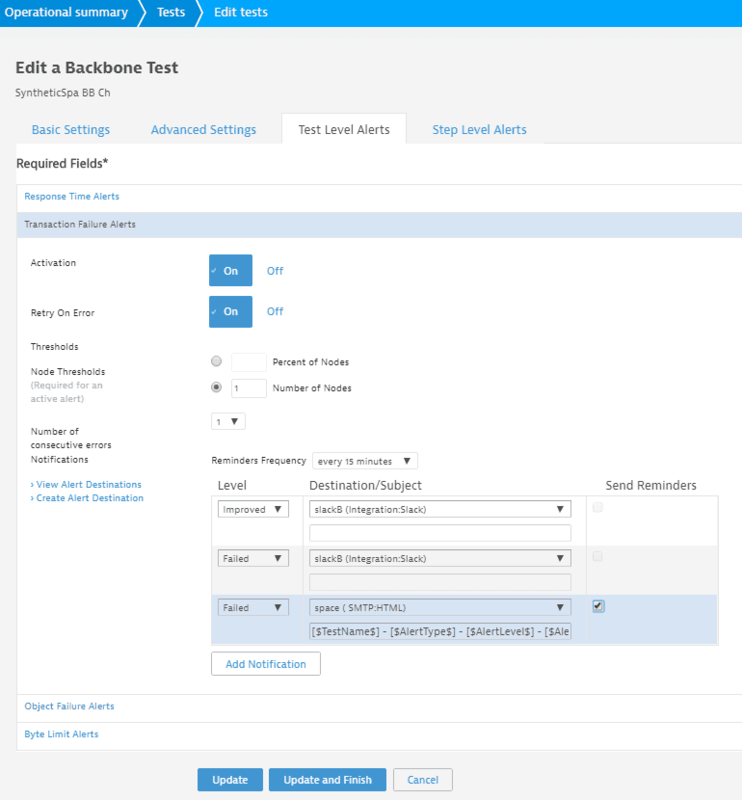 Enable Account-wide alerts control and any other options that apply to your Classic test types. In your test settings for Test Level Alerts, be sure to activate (On) your Response Time or Transaction Failure alerts. See detailed documentation on configuring alerts in Classic. For each alert type, click Add Notification to set up notifications for different alert levels and reminders. Select the Reminders Frequency (from every 5 minutes to every 12 hours) from the drop-down list. Set up notifications for Severe and Warning Response Time alerts and Failed Transaction Failure alerts—choose the alert destinations and configure the email subject. Click Add Notification if you need to add additional notifications. Check Send Reminders for your Warning, Severe, and Failed notifications (you can&apos;t send reminders for Improved notifications). 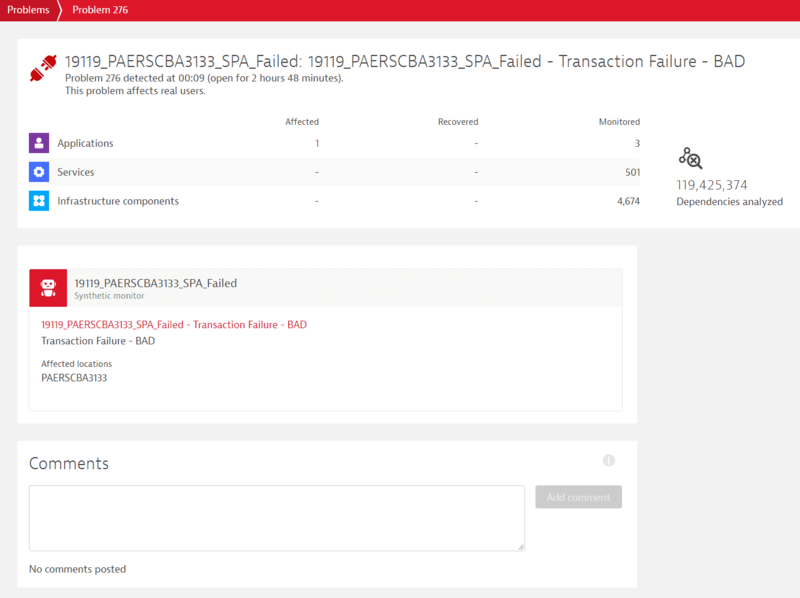 You can now see problems for your Synthetic Classic tests in Dynatrace. In the example problem below, Transaction Failure - BAD indicates a Synthetic Classic test problem.